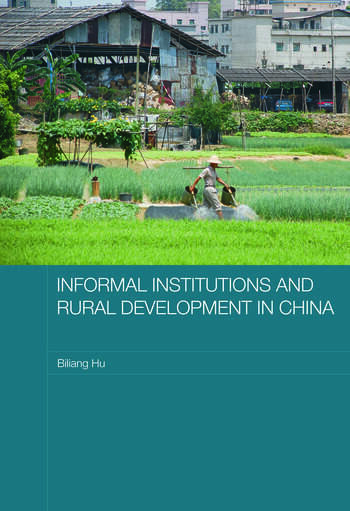 Providing an account of the role of informal institutions in Chinese rural development, this book, based on a decade of fieldwork of village life in the Chinese countryside, puts forth a distinctive argument on a very important topic in Chinese economic and social affairs. Focusing in particular on three major informal institutions: village trust and Rotating Savings and Credit Associations (ROSCAs), guanxi community and Integrating Village with Company (IVWC) governance, it argues that informal institutions, traditions and customs are all critical factors for facilitating modernization and social and economic development, promoting the integration of trust, reciprocity, responsibility and obligation into economic and social exchange processes and considerably lowering risks and transactions costs. This detailed account is an invaluable resource for postgraduates and researching studying and working in this area. Winner of the 2008 Zhang Peigang Development Economics Award. Biliang Hu is Professor of Economics at the Graduate School of the Chinese Academy of Social Sciences and Senior Research Fellow of the Academy's Rural Development Institute. He received his Doctorate of Economics from the School of Economics and Management, Witten/Herdecke University in Germany. His main academic interests are in institutional analysis in relation to village governance and rural development.